*Ten Bedrooms, *Twin staircases, *Lift, *Range of reception spaces. 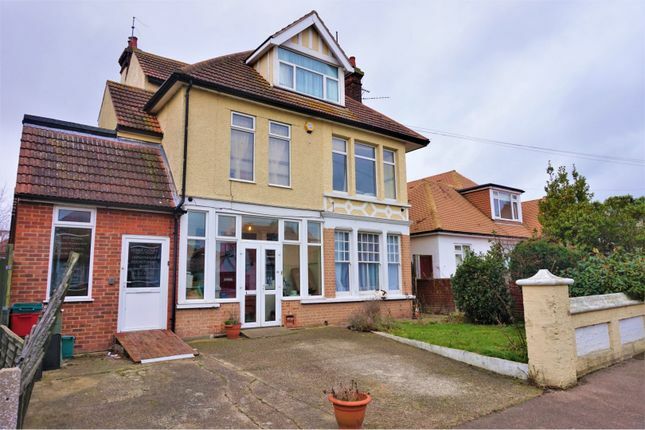 Situated in the heart of Clacton-on-Sea; within walking distance to the sea front, pier, town centre and Clacton-on-Sea railway station this unique property offers a world of opportunity. The property would make a lovely family home, or offers a great investment opportunity, or could be converted for business use. The house comprises of a porch, hallway, downstairs WC, kitchen, lounge, dining room, two offices, ten bedrooms, family bathroom, two shower rooms, two en-suites, middle floor WC, two utility rooms, a lift, two separate stair cases. Outside are is a good size rear garden with a summer house and off street, driveway parking to the front. *Simply click 'Brochure' to book a viewing instantly online. Double doors opening through to the porch, windows to the front aspect, double doors through to the hallway. Wood flooring, storage cupboard, lift access, stairs to the first floor. Low level WC, wash basin, window to the front aspect. Wood flooring, window to the side aspect, double doors out to the garden, TV and telephone points, radiator, electric fireplace. Wood flooring, telephone point, radiators, double doors out to the garden, breakfast bar. Space for washing machine, tumble dryer, radiator, extractor fan. Wood effect flooring, window to the front aspect, roll top work surfaces, a range of eye and base level units and drawers, two Butler sinks, a double hob with eight ring gas hob, i and half eye level oven spotlights, space for fridge freezer. Carpet flooring, door to the garden, radiator, fireplace. Shower cubicle, low level WC, radiator. Carpet flooring, window to the front aspect, radiator. Low level WC, shower cubicle, wash basin. Wood flooring, opening through to the utility room, doors to shower room and hallways. Shower cubicle, low level WC, wash basin. Roll top work surfaces, space for washing machine, tumble dryer, one year old combi boiler with ten year guarantee, back door to the garden. Separate front door, under stair storage, door through to the office, stairs to the second floor. Carpet flooring, lift access, stairs to second floor, storage cupboard. Carpet flooring, windows to the front aspect, radiator. Carpet flooring, bay window, storage cupboard, wash basin, radiator. Wood flooring, window to the side aspect, radiator. Carpet flooring, radiator, window to the rear aspect. Carpet flooring, window to the side aspect, wash basin, radiator. Low level WC, window to the side aspect, wash basin. Panelled bath with shower over head, wash basin, low level WC, window to the rear aspect, radiator, space for utility appliances. Carpet flooring, lift access, staircase to ground floor, staircase to first floor. Carpet flooring, window to the rear aspect, radiator. Carpet flooring, roll top work surfaces, sink and drainer, window to the front aspect, radiator. To the front aspect there is a driveway providing off street parking. To the rear the garden is mainly laid to lawn with a patio area, garden shed and summer house.